We love nature, gardens and walking surrounded by green. We also prefer veggies and non-spicy food. I hope I can show her some traditional spots in LA, too. Basically, what I do love: walk by Venice Canals Walkway, Venice Beach Boardwalk, and Abbot Kinney Blvd, buy organic fruits at Venice Farmers Market on Fridays (7-11am), visit Downtown (2-hour historic tour with www.FreeLAtour.com), hike in Malibu hills, visit Hammer Museum (contemporary art) & definitely go to Getty Museum- even if you're not into museums, the park & the view are amazing! You can also hang out at Fairfax High School flea market on Sundays, it's pretty cool! For food, I'd go to Sunny Spot for great sandwiches, The Counter for customized (veggie) burgers, Superba Food + Bread for delicious bread & croissants (ideal for brunch), Bottega Louie for yummy pastries, or further north, to Malibu Seafood for awesome (& cheap) seafood. Hey Lyn, ahah I am enjoying Venice so far but thanks for sharing all the good places in Manhattan Beach! May I suggest you to "write an answer" to that question instead of commenting, so that you can place them on the map... and everyone can get to see your wonderful pieces of advice! :) Thanks! The Huntington Library, Art Collections, and Botanical Gardens would be a GREAT spot for you guys to check out since you're into nature. It is in Pasadena (about a 40 min drive without traffic) but it's worth it! It is a beautiful museum with a ravishing garden. Fun fact: the stairs in the museum were designed by the same guy who designed the stairs in the Titanic! Check out Malibu Wines on the weekend. It is a great event that is nestled in the stunning Malibu mountains. There is live music and a large grassy area that is perfect for a picnic. Head downtown and check out Olvera Street. This is a fun spot if you're looking for any kind of Mexican inspired goodies. You get an old town feel here and there are a ton of authentic Mexican food restaurants. For food, I suggest checking out the restaurants in Manhattan Beach since you're staying in El Segundo (it's just the town over). Some of my favorites are Simmzy's, MB Post, North End Caffe, and Tin Roof Bistro. Since you like greens, try a healthier chain restaurant called Tender Greens Culver City. There is also one in Santa Monica too! I think you would also enjoy Cafe Gratitude in Venice! It's a vegan restaurant that has a lot of unique menu options. I hope that helps. Have a wonderful time with your mom! The South Coast Botanic Gardenin Palos Verdes is also a beautiful walking/picnic spot - took my mom there for Mother's Day last year. And a great vegetarian restaurant has been in Hermosa Beach for a long time... The Spot on Second & Hermosa Ave - yum! Palos Verdes is nearby and so is Hermosa. Easy drive + beautiful views. Great! Thank you, Heather !!! As far as some cool naturey types of spots in LA, I would suggest checking out two. 1. The Huntington Library, Art Collections, and Botanical Gardens. Plan on spending at least a few hours there, just strolling around. Grab lunch and relax. It's a cool spot. 2. Los Angeles County Arboretum and Botanic Garden. This is a botanical garden with tons of local vegetation. I haven't made it here, but it's on my list, and it sounds like it could be perfect for you and your mom. 3. **BONUS** If you guys go see museums, like the Natural History Museum of Los Angeles County or the Space Shuttle Endeavour @ California Science Center then make sure you take a few minutes to enjoy the Exposition Park Rose Garden. It's beautiful garden in the middle of the LA and overlooked by most people. Wow!!! I didn't know LA has all these gardens. Los Angeles botanic garden with tons of local vegetation ? Great! We're in! And of course, Manhattan Beach :))) thanks, JR! I would definitely recommend a rooftop brunch at The Penthouse in The Huntley Hotel. It may be a tad bit expensive and the brunch menu is not all encompassing nevertheless the view and the ambiance is worth it. If you are up for a heavy brunch buffet then I would suggest Duke's Malibu. Go along CA-1 and you get the added pleasure of having an awesome view while you drive to the place as well (Beware of weekend traffic though). Another restaurant I highly recommend is Maison Richard Café and French Bakery by Melrose Avenue. It is a quaint little french bakery- Perfect for quiet meals and catching ups! In terms of activities, you could walk around N Robertson Blvd- you may get lucky and sight a celeb- or go to Venice Beach Boardwalk. Also try the Los Angeles Zoo, drive to Pasadena, may be even a day trip to San Diego. It certainly helps :) Thank you, Deepak! I love gardens! My absolute favorite place in LA is Descanso Gardens in La Canada Flintridge for its enchanting oak forest and lovely camellias (and also roses). They have the largest camellia collection in the US and it should start blooming in early Fall (also a great time to go - not too hot and the leaves are starting to turn especially in the Japanese garden). I make the drive here from the west side at least twice a month - it's that special (and yes, I love it so much I keep renewing my membership there!) It's only 15 mins drive from downtown. It's like a fairy tale here. For food, lately I've been addicted to breakfast / brunch at Republique. Everything on the menu sounds very simple but perfectly made. Their pastries sell out quick especially on weekends. The gorgeous 1929 building itself is worth checking out - it served as Charlie Chaplin's office when it was first built. Runyon Canyon Park has great trails and they aren't too steep so I think she'd enjoy that since you like nature. See if there are any concerts at the Hollywood Bowl as well. There's a lot of new stuff downtown so you can check out museums, shopping or events at the Staples Center too. I just googled Runyon Canyon Park pictures to show my mom. We agree that the view is gorgeous! Thank you, Meredith! 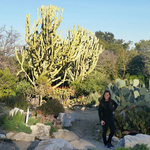 There are a lot of great botanical gardens around L.A., like The Huntington Library, Art Collections, and Botanical Gardens, Descanso Gardens, and the Los Angeles County Arboretum and Botanic Garden, to name just a few. Another lovely spot to visit is Self Realization Fellowship Lake Shrine Temple, which is primarily a religious retreat, but is open to the public and is quite lovely and a great place for a quiet, contemplative visit. I love Manhattan Beach, Hermosa Beach, and Redondo Beach. They are nice and laid-back communities. Tons of great restaurants of all price ranges as well lots of shops. Of course, they are by the ocean, but that doesn't mean you have to go in the ocean. A nice day trip would be Seal Beach and Huntington Beach. When we visit the L.A. area, we primarily like to just drive around and see things as we're driving around. It might be fun for your mother to drive through the Hollywood Hills, Beverly Hills, Malibu, etc It is always nice to visit LACMA (Los Angeles County Museum of Art) and see the latest show. Right near it is the La Brea Tar Pits (and associated museum) which are always nice to visit. You might also want to visit the Getty Museum. As you can see, my husband and I are primarily interested in absorbing views and communities, and visiting museums and gardens. We have little interest in doing things that can be done anywhere in the country (example: bungee jumping, etc). By the way, be prepared for lots of traffic. Patience is indeed a virtue in L.A. Have fun!